While holidays can be filled with joy, they can also bring up negative feelings for those who struggle with their relationship with food. Many of my clients tell me that the holidays are challenging because their forbidden foods are everywhere. I hope your holiday is filled with joy and gratitude. I’m grateful for the ability to take some time off to recharge, visit with extended family and spend some quality time with my kids. If you’re like many of my clients, you find the holiday season to be very challenging. You’re surrounded by forbidden foods, messages about good and bad foods, and you might even feel guilt and shame when you eat certain foods. Take time for yourself. Sometimes, all that family closeness, and cooking and being surrounded by food can take its toll. Schedule some time to do something you love: a stroll around the block, knitting by the fire, reading a great book, taking a nap. There are no rules here. Just do it! Challenge the feelings that arise. What feelings come up for you? Acknowledge them, reframe them and cast them aside. Here’s an example: You might feel like you don’t shouldn’t eat the pie because it’s not on your eating plan. Reframe it: “Pumpkin pie is one of my favorite desserts. I can enjoy eating it, savoring the taste and texture, until I feel satisfied. Pumpkin pie will give me energy and end the meal on a sweet note! ” Then, sit at the table and enjoy eating your pie, taking the time to appreciate the flavor and texture. Be fully present in the experience! Take a deep breath to center yourself before you eat. In some families, this might take the form of a pre-meal prayer, but whatever your style, find some way to take a few deep breaths and set a positive intention for your meal. 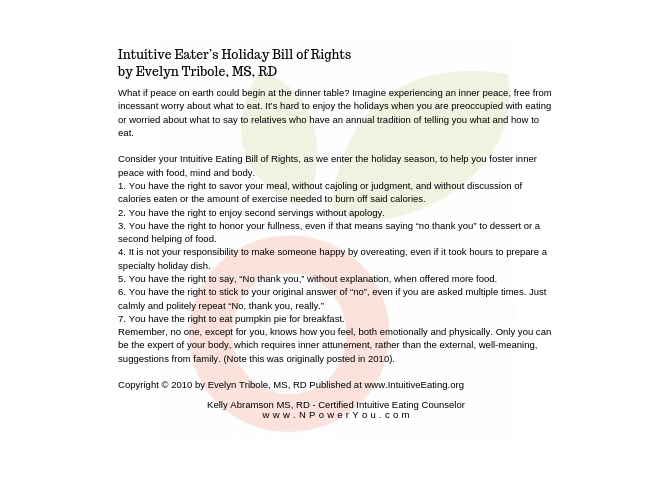 Lastly, I’d like to share the Intuitive Eater’s Holiday Bill of Rights by Evelyn Tribole MS, RD. May this tool help you thoroughly enjoy food this holiday season. 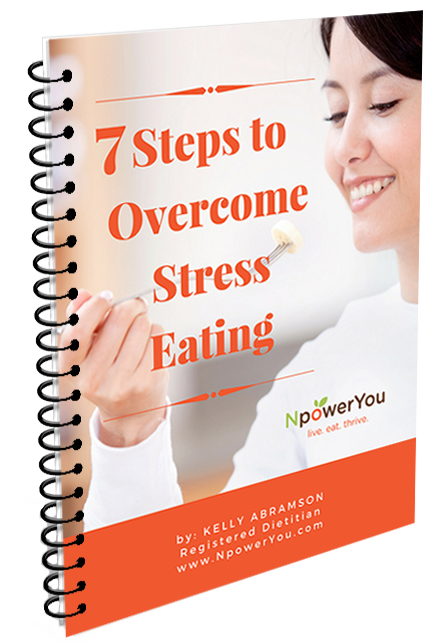 Did you know that you can learn a lot about your relationship with food during the holiday season? Many women don’t even consider beginning to do this work in December because they are tied to the notion that new beginnings are tied to January. Intuitive Eating isn’t a diet and there’s no “best” time to start. Many of my clients find that they learn so much about themselves when they attend a holiday party and examine it through a non-judgmental lens. I say it a lot, but you can’t screw up Intuitive Eating! If you want to find out more about how I help women find joy in food and their bodies again, click here to book a complimentary 15-minute discovery call with me. We’ll discuss your areas of struggle, your goals for the future and I will show you different ways that you can make them a reality.